President Barack Obama holds an 8-point lead over Republican nominee Mitt Romney among likely voters in Minnesota, according to poll results released on Friday by the St. Cloud State University Survey. When all poll respondents are included, Obama's lead grows to 13 percentage points. President Barack Obama holds an 8-point lead over Republican nominee Mitt Romney among likely voters in Minnesota, according to poll results released on Friday by the St. Cloud State University Survey. When all poll respondents are included, Obama’s lead grows to 13 percentage points. The annual survey was conducted from October 15 to 21. It included 601 respondents, 272 on cell phones and 329 on land lines. The poll had a margin of error of plus or minus 5 percentage points. The partisan makeup was 32 percent Democrats and 23 percent Republicans. Self-identified independents represented 37 percent of those surveyed. 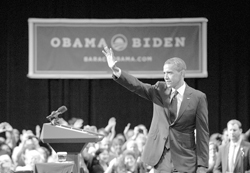 Obama’s largest lead was with respondents aged 18 to 24, which preferred the incumbent by a 62-to-30 percent margin. The only demographic won by Romney was those aged 45 to 54. Obama also led among all income levels except those making more than $100,000. In that category Romney held a 47-45 percent lead. Two other recent presidential polls, conducted by Public Policy Polling and SurveyUSA, showed Obama with a 10-point lead in the state. Rasmussen Reports showed a closer race, with Obama up by just 5 points. Perhaps next time you might want to include topline in your report as well. How exactly are you justifying a +9 Democratic advantage when the 2008 election was only a +4 Democratic advantage?. You are saying the advantage will grow 125%, which seem ludicrous. I think it is safe to say this is a poor sample. Wow, plus 9 points Dems? Granted Minnesota is a retrograde state because of it’s purple proclivities, but you guys need to lay off of the wacky weed. Who conducted this poll? The Choom Gang?